Last week, OSHA released its top 10 OSHA violations of 2018 list at the National Safety Congress in Houston, TX. The administration’s deputy director, Patrick Kapust, announced the results during the National Safety Council Congress and Expo. Fall protection tops the list for the eighth year in a row. The top five violations also remained unchanged for the fourth consecutive year, which includes respiratory protection landing, again, at number four. However, there is one newcomer on the list at #10. This is the first year that PPE has been ranked in OSHA’s top 10 violations, replacing Electrical Wiring Methods. 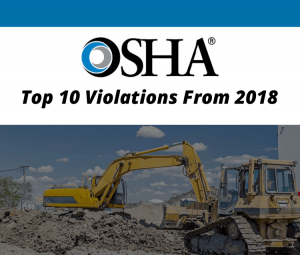 OSHA’s top 10 list is based on an estimated total of 32,266 violations from the fiscal year 2018. These violations were found only by the federal agency and precluded violations found by state enforcement agencies. Respiratory Protection and Personal Protective Equipment are important standards in protecting employees against occupational health hazards such as chemicals and dust. Worksite Medical can ensure that your job site is compliant with at least two of the most common OSHA violations. We offer services including respiratory clearance & testing, PPE fit testing, heavy metals lab testing, and much more. Our mobile medical unit can come directly to your workplace for your convenience! Call us at 1-844-OCCU-MED to schedule an appointment, or visit us online.